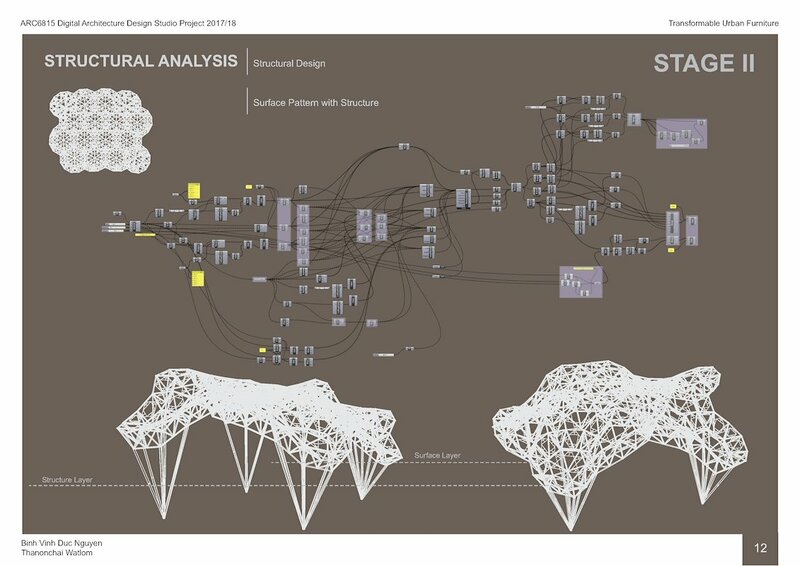 Plant environmental reactions has long been a source of inspiration in the making of digital architecture, since they are both passively respond to surrounding context. 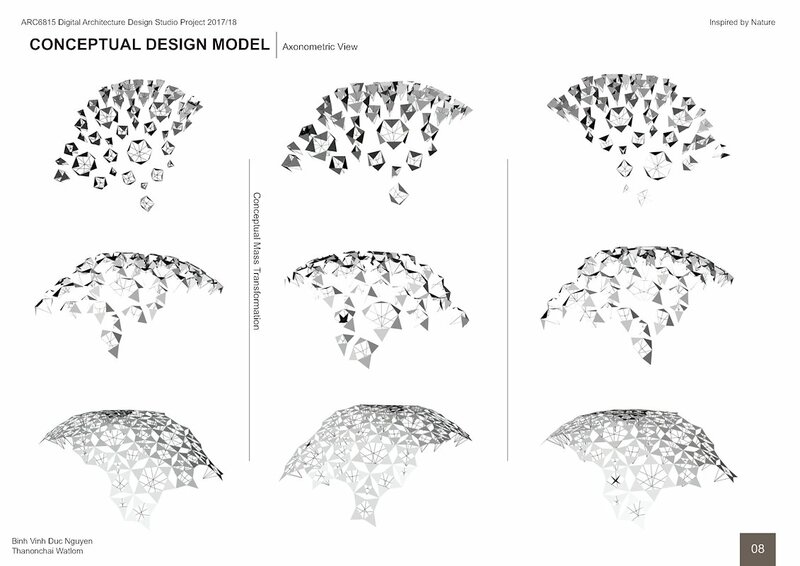 Considering the pinecone nastic movement, this study explored the parametric design process of an interactive pavilion. 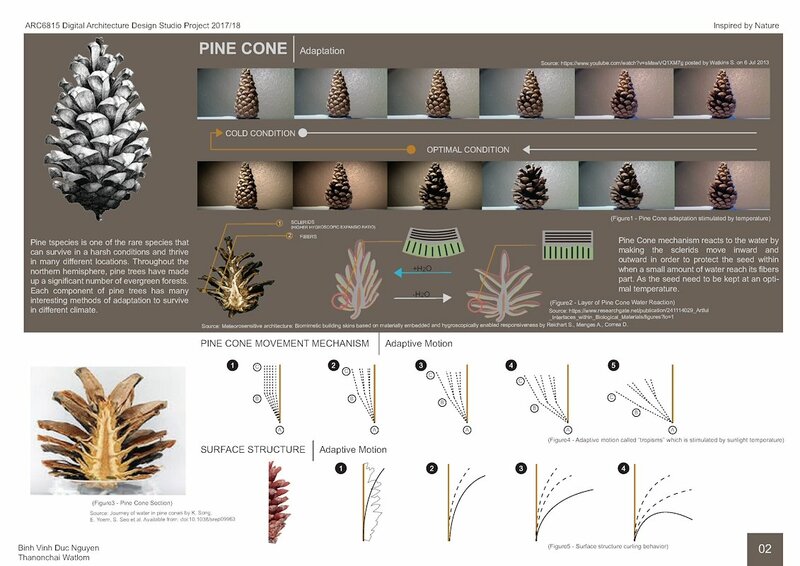 The mechanism of pinecone scale movement is complex, involving different materials at a micro scale, which has been studied and applied into material science (Reichert 2014). 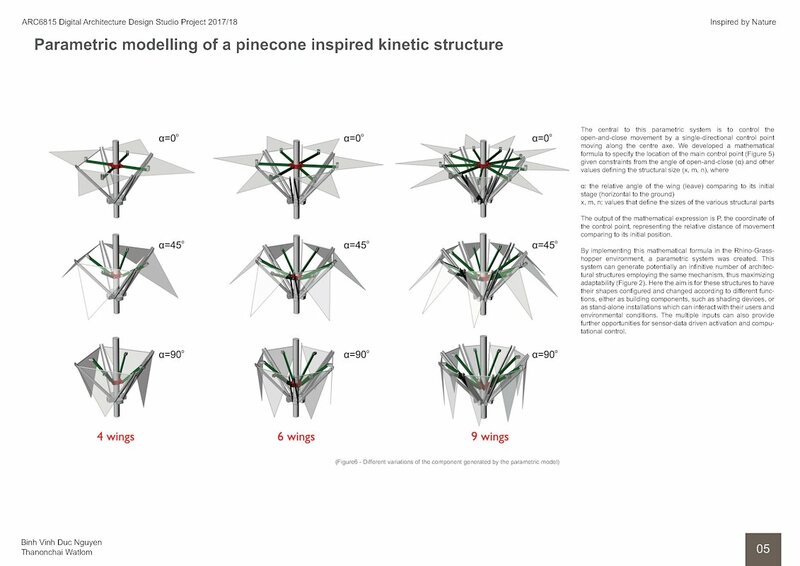 However, in this study we propose a simple parametric model that provide a mechanical-based bio-mimicry in the form of a kinetic single-material architectural system. Taking in the same inputs (i.e., environmental conditions such as light, temperature, humidity, etc.) 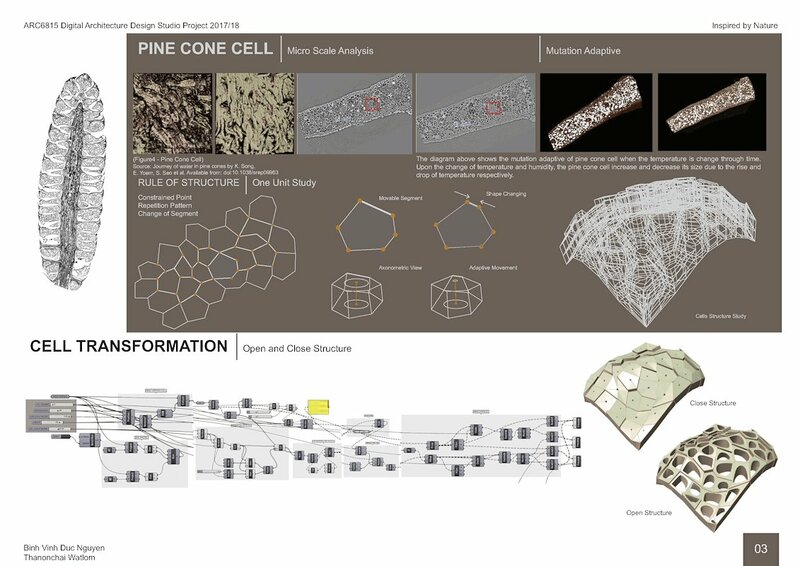 and giving out a similar output (i.e., the movement of open and close), our model simulates the morphological structure of a pinecone (moving wings surrounding a centre axis) that can be applied to various building components. 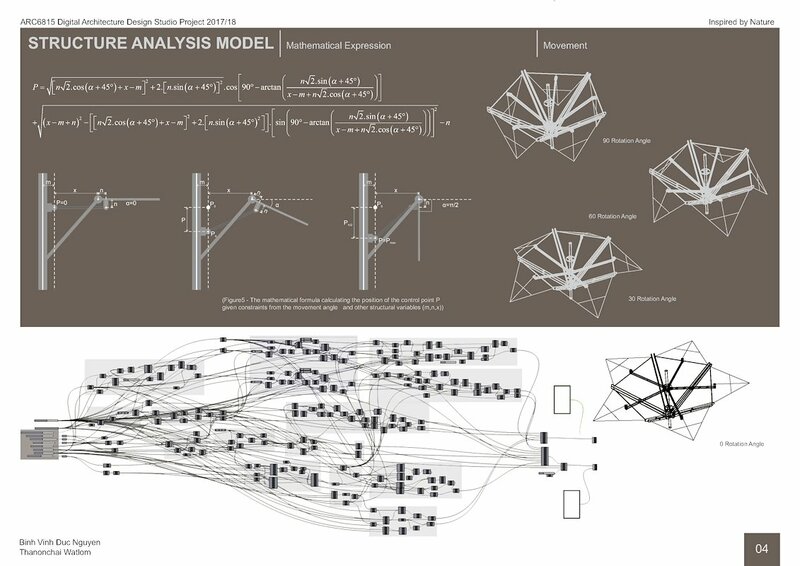 By implementing mathematical formula in the Rhino-Grasshopper environment, a parametric system was created. 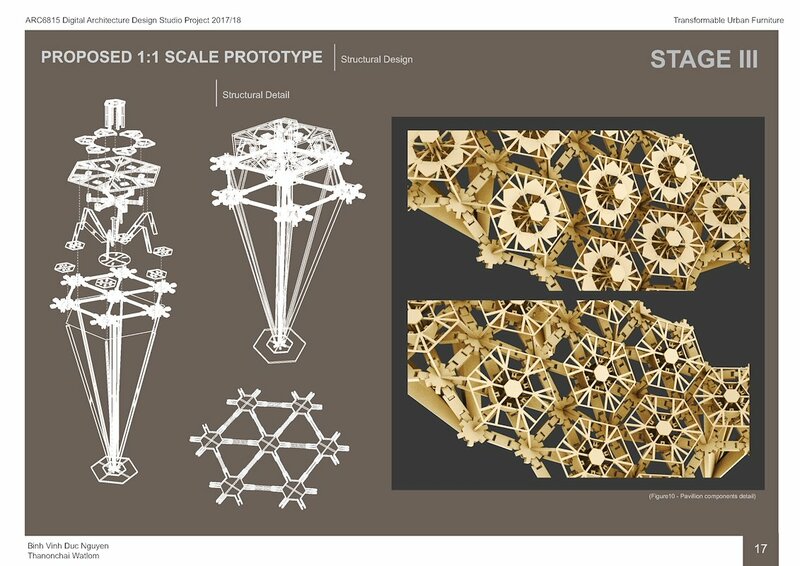 This system can generate potentially an infinitive number of architectural structures employing the same mechanism, thus maximizing adaptability. 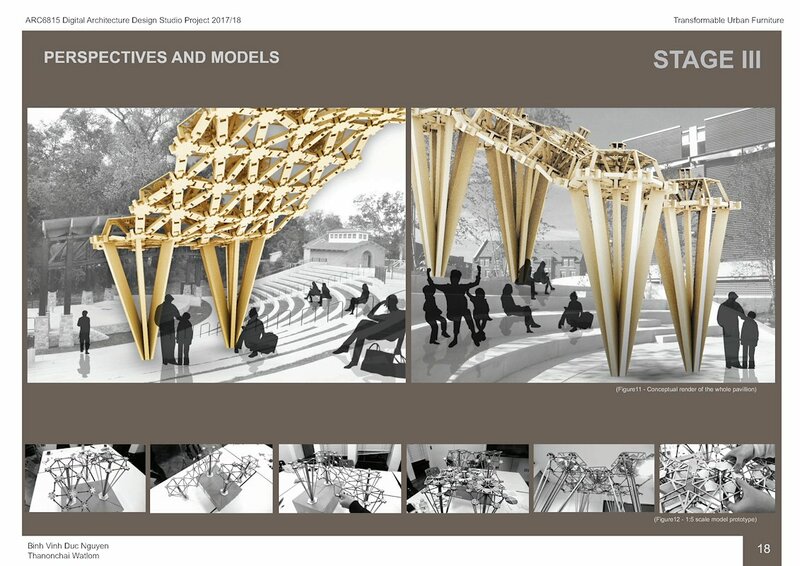 Here the aim is for these structures to have their shapes configured and changed according to different functions, either as building components, such as shading devices, or as stand-alone installations which can interact with their users and environmental conditions. 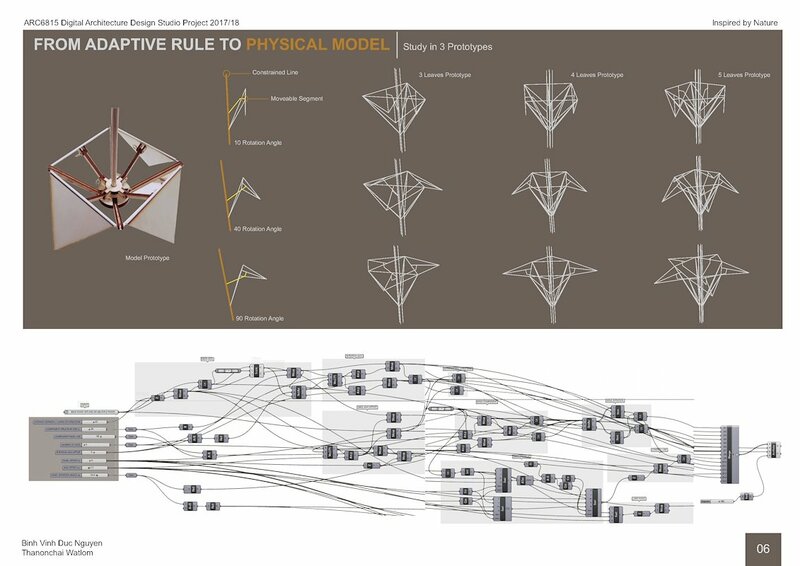 The multiple inputs can also provide further opportunities for sensor-data driven activation and computational control. 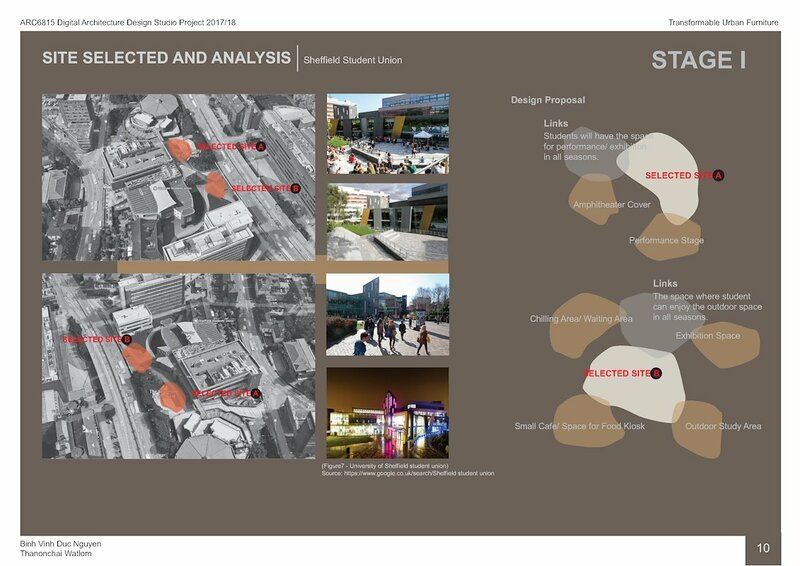 Based on the previous parametric modelling system development, we carried out a test case study by applying these components to a site in the university campus. 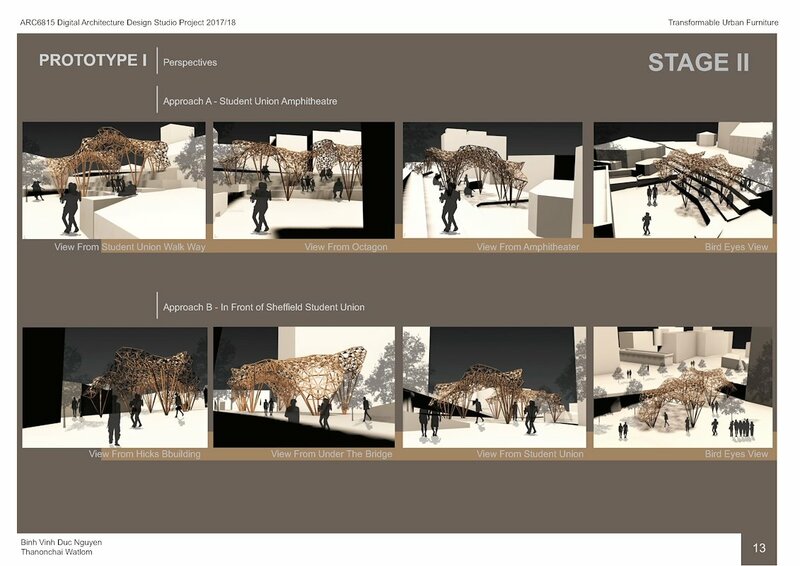 The idea here is twofold: (1) to test the flexibility of the structure if it can adapt to different topographical conditions, and (2) to preserve its kinetic characteristics through an interactive installation at upper layer. 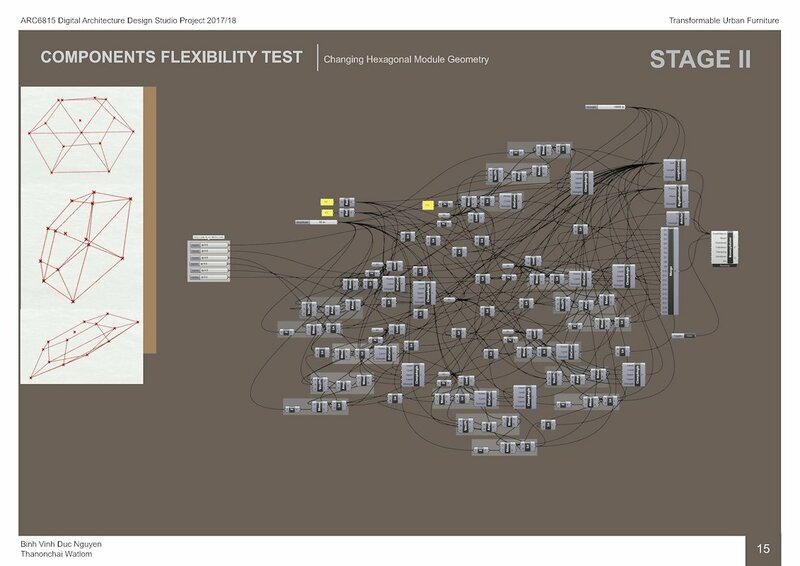 In the process this digital design study, we mainly explored the concept of ‘flexibility’ and ‘adaptability’. 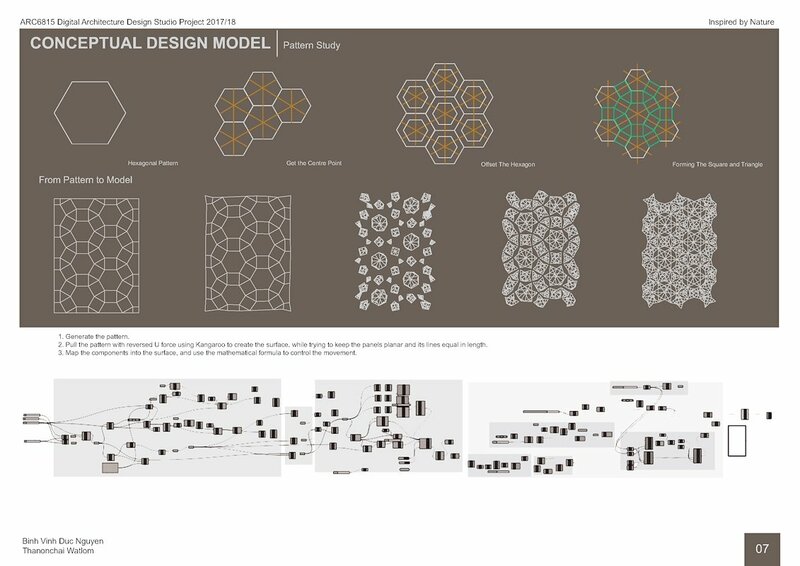 While an architectural component needs to be flexible to be applicable to different contexts, the adaption process applied to a specific site actually transforms it and limits its flexibility. Therefore, the para-metric tools were used in both ways: to generate the flexibility as well as to limit it in order to gain adaptability. 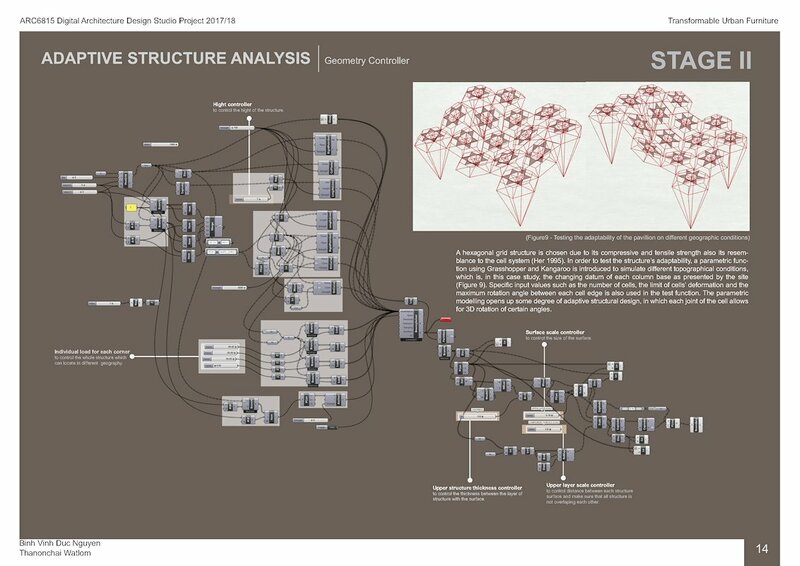 In other words, the design process be-comes an information feedback loop between idea development and (site-specific) possibility evaluation.